"Today, I will take my rightful place among the gods. It is a victory for all that is dark and unforgiving. Our ancient code demands we never reveal the prophecy recorded in the Temple of Light. Ekimu will honor that vow... even if that means the Toa will never know their true power, and darkness will rule forever." Makuta the Mask Hoarder,also known as Dark Lord Makuta[E], is a former Mask Maker from Okoto, brother of Ekimu and creator of the Mask of Ultimate Power. He is currently trapped in the Shadow Realm after a final confrontation with his brother and the Toa. Though Makuta was never released as an official set, models for both his original Mask Maker and transformed Shadow Titan forms were created by the BIONICLE design team. These models were both seen as inspirational models in The Makuta Challenge building contest. The first form is the one seen in media such as the 2015 Online Animations, while the second was built exclusively for The Journey to One. Shortly after it was unveiled in the contest video, the BIONICLE design team provided images of the build to serve as instructions to create Makuta. The larger form is built out of parts from seven sets: 70790, 70795, 71303, 71308, 71309, 71310, and 71316, although there is no set piece for the Mask of Ultimate Power. "I still sense evil. Makuta is out there somewhere, and his dark powers continue to grow. We must find him and stop him." "As strong as you think you are, I am stronger. There are events that must transpire so that I may be freed. You are Hunter no more. You are my minion. You are Destroyer." Concept art for silver Makuta. Makuta was voiced by William Jordan in The Journey to One. Makuta's appearance after donning the Mask of Ultimate Power varies between depictions: the Online Animations and The Journey to One saw him change color and increase in size, Gathering of the Toa saw him change color but not size, and Battle of the Mask Makers saw him retain his original size and color scheme. There was also some variation between Makuta's Online Animation/Graphic Novel depiction and that seen in The Journey to One: in the former his build was nearly identical to Ekimu's, whereas the latter depicts him with a gold chest plate. 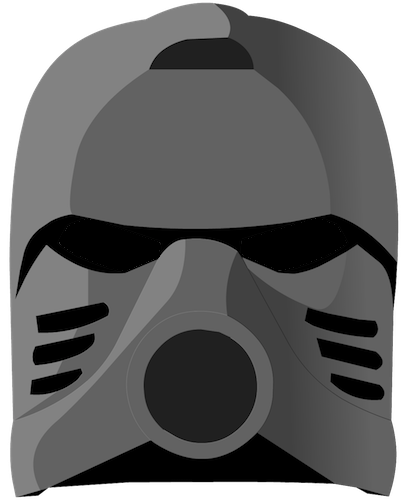 Concept art for Makuta as he appeared in the 2015 Online Animations depicted Makuta with silver armor rather than gold, as well as giving him his own silver colored Protector/Okotan mask. Teridax - The envious antagonist of the Generation 1 story, often referred to as "Makuta". This page was last edited on 11 October 2018, at 23:22.